Provide comfort for the family of Edmund Mulligan with a meaningful gesture of sympathy. 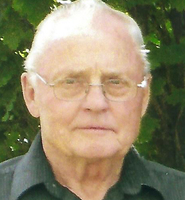 Passed away peacefully at the Brantford General Hospital on Thursday, March 14, 2019 in his 88th year. Beloved husband of the late Elizabeth Mulligan (2002). Loving father of Donald (Kathy), Frank (Tammie) and Paul (Cindy). Proud grandpa of 6 grandchildren and 1 great-grandchild. Dear brother of Dorothy (Charles) Buchanan. Ted was predeceased by his siblings Donald, Bernard, Carl, Norma, Jack and Terrance. He will also be missed by many other extended family members and friends. The family wishes to extend a special thank you to the Nursing staff in the CCU and on the 8th floor of the BGH for their kindness and care. Family and friends will be received at the TOLL FUNERAL HOME, 55 Charing Cross Street, Brantford on Wednesday, March 20, 2019 from 2-4 and 7-9 p.m. A Funeral Service will be held on Thursday, March 21, 2019 at 11:00 a.m. in the funeral home chapel. Interment to follow at Mount Hope Cemetery. Donations in memory of Ted can be made to the Heart and Stroke Foundation of Ontario. Provide comfort for the family of Edmund Francis "Ted" Mulligan by sending flowers. Thinking of you Paul and your family. Ted you were a GREAT MAN. I am very blessed to have met you. I will cherish the sweetess memories of you always.